This is a column chart (or bar chart) summarising the breath types. For those of us who know how to read a graph, it can be difficult to imagine what another person could find difficult. But then when I am presented with an unusual style of graph, or one where the data has been presented badly, I suddenly feel empathy for those who are less graph-literate. Graphs are more common now as we have Excel to make them for us – for better or worse. An important skill for the citizens of tomorrow and today is to be able to read a graph or table and to be critical of how well it accomplishes its goals. Here are some stages of reading a graph, much of which also applies to reading a table. When one is familiar with graphs, and the graph is well made, we can become oblivious to the conventions. 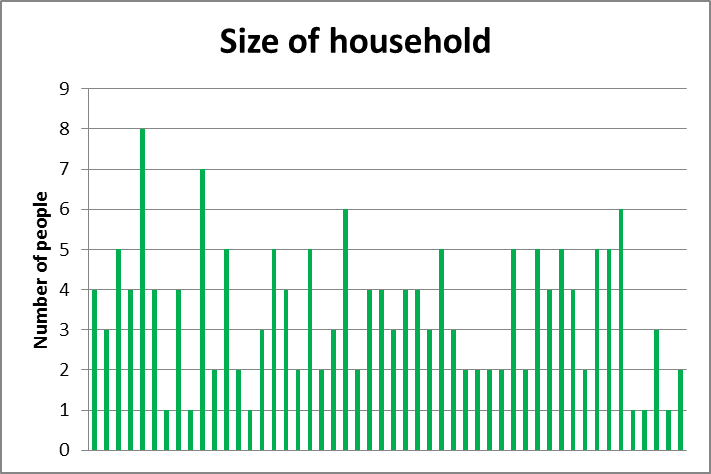 Just as readers know that English is written from left to right, graph readers understand that the height of a bar chart corresponds to the quantity of something. When people familiar with graphs look at a graph, they take in information unconsciously. This would include what type of graph it is – bar chart, line graph, scatterplot…and what it is about – the title, axis labels and legend tell us this. And they are also able to ignore unimportant aspects. For example if someone has made a 3-D bar chart, experienced graph-readers know that the thickness of the bar does not express information. Colours are generally used to distinguish different elements, but the choice of which colour is used is seldom part of the message. Other aspects about graphs, which may or may not be apparent, include the purpose of the graph and the source of the data. When children start making and reading graphs, it is good for them to start with data about themselves, often represented in a picture graph, where each individual observation is shown. A picture graph is concrete. Each child may point out their particular piece of data – the one that says that they like Wheaties, or prefer mushrooms on their pizza. This is an early stage in the process of abstraction, that leads eventually to understanding less intuitive graphs such as the box and whisker or a time series chart. It is also important for all graph readers to be aware what each piece of data, or observation, represents and how it is represented. Identifying one piece of data may help avoid the confusion of graphs which show raw data rather than summary data. 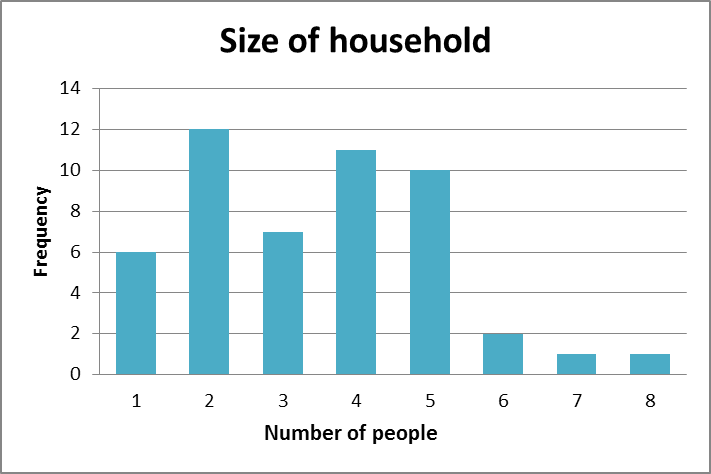 For an example, a class may have data about the number of people in households. If this data is entered raw into a spreadsheet, and a graph created, we can end up with something like the graph immediately below (Graph 1). In this we can identify that each member is represented by a bar, and the height gives the number of people in their family. I usually call this a value graph, as it shows only the individual values, with no aggregation. 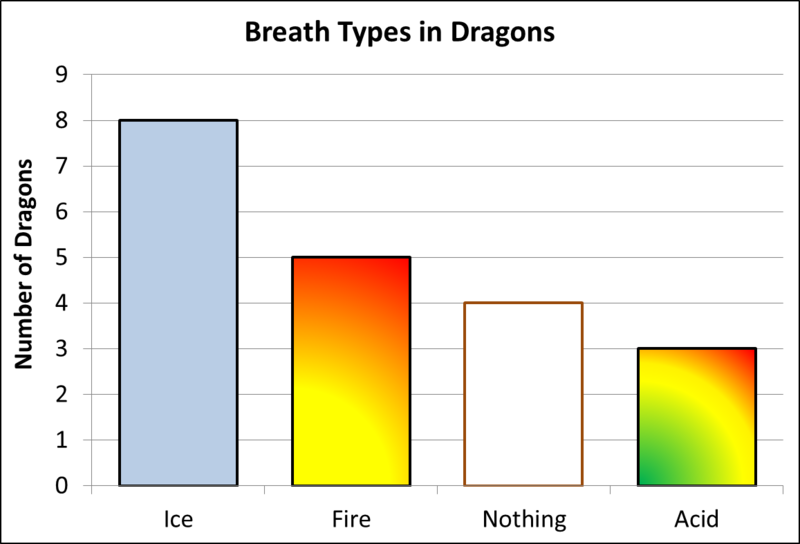 A more useful representation of this same data is a summary bar chart, as shown below. (Graph 2) There are two dimensions operating. Horizontally we have the number of people in a household, and vertically we have the number of class members that have the corresponding number of people in their household. Note that it is less intuitive seeing where each class member is. Dividing the bar up into individual blocks can help with that. Reading within the graph is a more complex task, even with simple graphs. When we read within a graph we are interested in comparisons and relationships. For example we may wish to see which breath type is most common among our herd of dragons. In order to answer this using the graph below, we first need to find the highest bar, by drawing our eye along the top, or drawing a ruler down the page. Then we look down that bar, and read of the name of the breath type. There are many more complex relationships, such as whether green dragons tend to be taller or shorter than red dragons, and which are more likely to be friendly. By introducing another attribute, we are in fact adding a dimension to our analysis. The advantage of programs like Excel is that many people can make graphs without too much trouble. This is also a problem, as often the graph Excel produces is not really suitable for the task, and can have all sorts of visual clutter which obscures the information displayed. Learners need to think about the graph, either their own, or one they are reading and ask whether it is successful in communicating correctly the information that needs to be communicated. Does the graph serve the purpose it was created for? I suggest that the steps listed here are a worthwhile structure to use in reading graphs, particularly for beginners. This then leads into another process, summarised as OSEM. You can read about this here in this post, A helpful structure for analysing graphs.